Jon Parrish Peede, Chairman of the National Endowment for the Humanities (NEH), far left, with members of the Dennis Farm Charitable Land Trust (DFCLT) team during a program announcing NEH grant to DFCLT, Christ Church, Philadelphia. Photo, Alfred B. For, courtesy DFCLT. 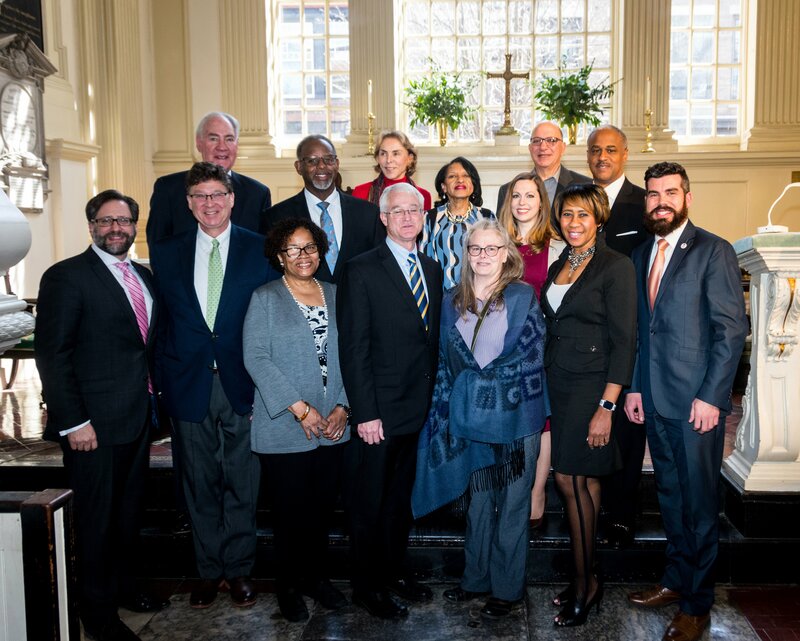 On a sunny morning, March 28, 2019, during a program at Historic Christ Church in Philadelphia where George Washington, John Adams, Benjamin Franklin, Betsy Ross and the Continental Congress worshiped, Jon Parrish Peede, Chairman of the National Endowment for the Humanities (NEH) announced that The Dennis Farm Charitable Land Trust (DFCLT) is the recipient of a $400,000 matching Infrastructure and Capacity Building Challenge Grant from NEH. The Dennis Farm will use the grant and matching funds to restore and rebuild the 195-year-old Dennis farmhouse for repurpose as a museum. The historic farm is in the process of raising funds to match the grant and receive the NEH award. Additional building plans for the 153-acre site include the construction of an Interpretive Center that would house public events, rotating exhibits, and a research library. As part of its fundraising effort, DFCLT is hosting a “Spring Fête and Fundraiser” on May 2, 2019 at the National Constitution Center in Philadelphia. For ticket information, visit thedennisfarm.ticketleap.com or view our Events page. Of the 233 NEH grants announced nationwide, only 16 of the highly coveted grants were awarded in Pennsylvania. The National Endowment for the Humanities matches contributions with federal funds on a one-to-one basis to stimulate private support for projects in the humanities. In addition to the Dennis Farm, grant recipients announced at the March 28 program include Christ Church, to repair the steeple; the Philadelphia Museum of Art, for building projects; and the Culture Trust of Greater Philadelphia, for a documentary about the Philadelphia Orchestra. The purpose of The Dennis Farm Charitable Land Trust is to continue to develop the more than 200-year-old, 153-acre farm into an educational and cultural site for scholars, researchers, educators, and others interested in the farm’s extraordinary history.